Warehouse 242?will host an event comprised of live jazz, refreshments, a panel discussion, and a book release surrounding incarceration and its affect on our city. ?The book sale proceeds will be donated to our Families Doing Time program.The event is free and open to the public. 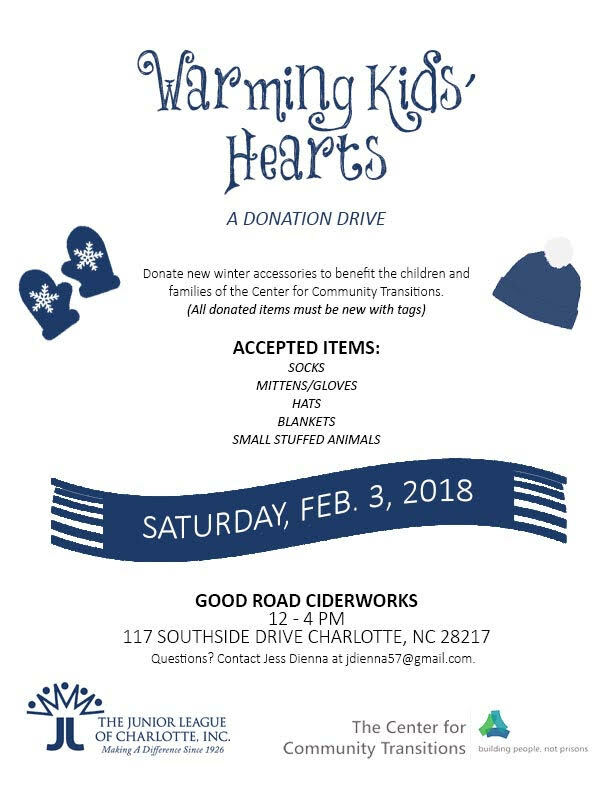 The Junior League of Charlotte is hosting a donation drive for new winter accessories to benefit our Families Doing Time families. They are accepting socks, mittens/gloves, hats, blankets, and small stuffed animals. All items must be new with tags. Contact Jess Dienna at?jdienna57@gmail.com?with questions. Support CCT While You Shop! If you’re an Amazon Prime member you can easily set up your account to donate a portion of your purchases to CCT. AmazonSmile is a website operated by Amazon that lets customers enjoy the same wide selection of products, low prices, and convenient shopping features as on Amazon.com. The difference is thatwhen you shop on AmazonSmile, the AmazonSmile Foundation will donate 0.5% of the price of eligible purchases to CCT. ?Start supporting CCT today! Community Volunteer Sponsors?are needed to be trained to transport the women residents into the community for excursions to church and various other activities like shopping and entertainment, substance abuse meetings, etc. ?Due to state regulations, volunteers must be female. Skill building volunteers?are needed to assist the women with school tutoring, computer training, resume writing, cover letter writing, etc. If interested, contact Families Doing Time Program Manager, Charis Blackmon at?cblackmon@centerforcommunitytransitions.org. Empowering Kids with Incarcerated Parents (EKWIP):?We will need assistance printing and binding EKWIP workbooks for these school-based support groups. Additionally, volunteers that are consistently available during school hours on weekdays are needed to serve as group assistants during EKWIP groups. A background check would be required for all potential group assistant volunteers. Data Entry:?As we shift to a new data system, we will need volunteers to help with data entry. Chaperones?are needed to assist with our quarterly cultural excursions (Enrichment Institute) to be held in November, February, and April. Resume Development:?Every other?Wednesday? @?10:45 AM? (schedule may vary with holidays) – Assist clients participating in the employment readiness program with the development/revision of their resume. FRESH START Goal Setting: Schedule open but will need to be consistent – Assist clients with their goal setting and stability tracker – training will be provided. Warehouse 242?will host an event comprised of live jazz, refreshments, a panel discussion, and a book release surrounding incarceration and its affect on our city. The book sale proceeds will be donated to our Families Doing Time program. The event is free and open to the public. CCT?s Families Doing Time Program Director, Charis Blackmon, will be participating in the panel discussion and sharing?her insight on how this conversation affects Charlotte. JustLeadershipUSA is dedicated to cutting the US correctional population in half by 2030. JLUSA empowers people most affected by incarceration to drive policy reform. On Saturday, February 17, JLUSA brings its Emerging Leaders program right here to Charlotte! All Emerging Leaders participants must have prior involvement with the criminal justice system (juvenile and/or criminal justice involvement is required to be eligible and includes but is not limited to: actual incarceration [served time in jail and/or prison], arrest with or without conviction, under community supervision, i.e. parole, sentenced to probation-only, and involvement as a client in the juvenile justice system). Sugar Creek?Charter School will be hosting a student led open-mic night with all proceeds coming to the Families Doing Time program. The event will surround children of incarcerated parents and will highlight Families Doing Time?s work within the community. SAVE THE DATE ? CCT is hosting its first ever Build People, Not Prisons evening event. The event will feature a live performance by?Playing for Others?teens, Hors d?oeuvres, and beer and wine. More details and ticket information to come. SAVE THE DATE for CCT’s 6th Annual Spring Fling. Details to come.